Took some time while waiting for the additional extrusions to arrive making a control plate for the I2C panel and power switch. 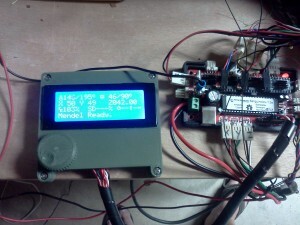 The LCD, SD and encoder are currently being used on my Solidoodle so I’ll switch everything over toward the end. Wow, this is going to look much better than the 3d Printed housing and give me a power switch that the Solidoodle was lacking. 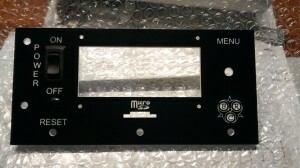 The plate was made from some black on white acrylic from Inventables. The graphics were put together in Corel Draw and cut on my 40W Laser. I put 5mm holes around the edge that will act as a mount and to stabilize the H-frame. Since I’m creating something of my own design, I wanted to go big on the bed to make single prints from large objects instead of assembling from smaller parts. I had quadcopter and OpenRC builds specifically in mind. My Soilidoodle 2 is 6×6 and too small for many things I wanted to print. So this will be a 12×12 plate.